A crowded opening day at Arapahoe Basin Ski Area in Keystone, Colo.
Gogatz and Ryan are able to afford to ski so much because they bought Ikon passes, which were just introduced this season by the the Alterra Mountain Company. Ikon is priced starting at around $600 and includes access to dozens of resorts and some of the most famous ski mountains in the world, including Aspen, Jackson Hole and Deer Valley. Ikon, and its main competitor, The Epic Pass, which was introduced a decade ago, have made it possible to ski for an entire season for what you could spend on a three-day lift ticket, as long as you commit early. But some locals complain the passes are destroying the character of their beloved mountains. 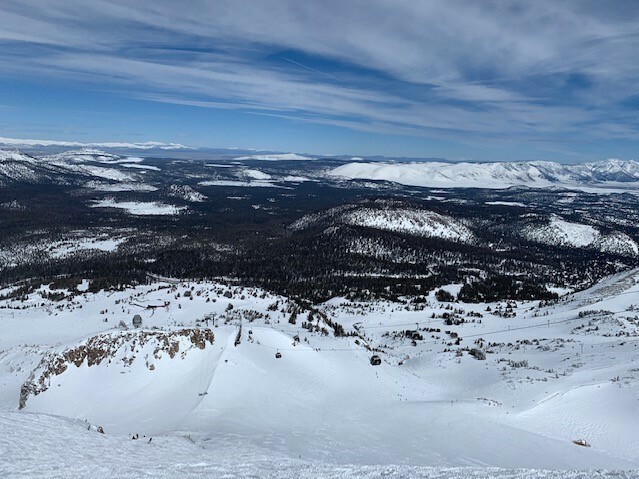 Mammoth Mountain is one of the 38 destinations accepting the Ikon pass, which has led to some locals complaining about the crowds. "We're seeing more people on the hill and longer lift lines and whenever you're waiting in one of those lines you'll hear some local quip about the Ikon passholders," said Matt Maydick, who lives in Carbondale, Colo., right outside Aspen. Maydick, himself an Ikon passholder, says he is happy more people are getting to enjoy his favorite sport but he is frustrated by the growing pains. Ikon passholders have been accused of not only making the mountain too crowded but also of being in over their heads. There has been more hostility in Jackson Hole. When Joe Cascia of New Jersey visited recently, he encountered a local who griped about Ikon passholders for being cheap and not spending enough at local restaurants. "I'm not sure why he would seen that as a negative, because I think everybody should be trying to save money," said Cascia, who said he pointed out that he had just spent almost $200 on dinner. Cascia's girlfriend usually proudly displays her Ikon pass on her helmet but at Jackson Hole he thought it would be better for her to hide it. "I even told her you might want to put that in your pocket here because it just didn't feel 100 percent welcome," Cascia said. Resorts have tried to ease tensions by pointing out that Ikon passholders are not the only reason for overcrowding and that resorts gain valuable revenue from the pass. Taylor Middleton, the general manager of Big Sky Resort in Montana, even penned an open editorial to local residents ordering them to be nicer. "Recently, local social media channels are revealing a rash of really negative postings, shunning new visitors and treating new arrivals differently than we were treated ourselves," wrote Middleton. "We were all new at some point; these guests are our newest visitors." In fact, Ikon passholders only account for a small increase in the number of visitors at most resorts this season. The biggest reason for the crowds is this season's heavy snow, according to resort owners. "I think the Ikon pass is somewhat unfairly blamed by some," said Middleton. Like it or not, the pass is here to stay, according to Erik Forsell, Alterra chief marketing officer. "We definitely launched with the idea of disrupting in a positive way the ski industry and we did," said Forsell. Forsell says resorts like locking in guaranteed revenue in case of a bad snow year. Next season's pass went on sale last month, starting at $649. 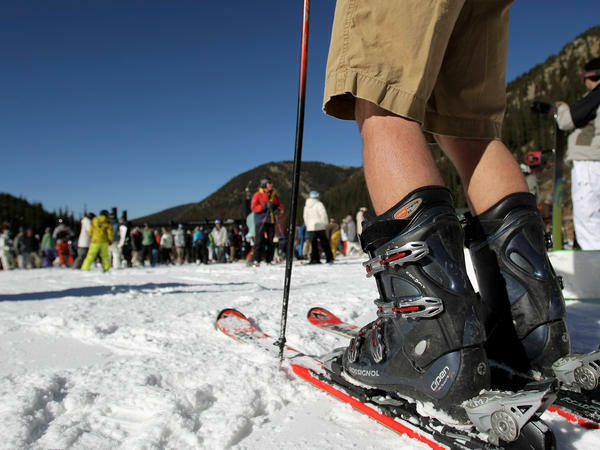 One skier from Salt Lake City commented on the Facebook announcement: "You have ruined skiing. Please stop." Skiing's long been an expensive sport. It's not uncommon for a lift ticket to set you back upwards of $200 a day. While the price of day passes has been rising, the industry has been embracing new multi-resort season passes that are cheaper than ever. They've proven to be popular but also controversial, as Ben Bergman reports. BEN BERGMAN, BYLINE: On a recent 50-degree bluebird day at Big Bear Mountain outside Los Angeles, skiers in short sleeves flew down the mountain. Then it was time to party at the base with loud music, beer and bragging about how many days they've skied. Here's Daniella Gogatz. DANIELLA GOGATZ: At least over 10. BERGMAN: Ryan is able to afford to ski for a month because he bought something called the Ikon Pass, which was just introduced this season. It's priced starting at around $600 and includes access to dozens of resorts, including some of the most famous mountains in the world. RYAN: It's costing me about, so far, 20 bucks a day or less at this point. BERGMAN: Ikon and its main competitor, Epic, have made it possible to ski for an entire season for what you could spend on a three-day lift ticket as long as you commit early. What's wrong with that? Well, plenty according to some locals who complain the passes are destroying the character of their beloved mountains. Matt Maydick lives in Carbondale, Colo., right outside Aspen. MATT MAYDICK: We're seeing longer lift lines, more people on the hill. But whenever you're waiting in one of those lines, you'll always hear some local quip about, you know, the Ikon passholders. BERGMAN: Not only because they make it too crowded but also that they're in over their heads on the mountain. In short, they don't deserve to be skiing Aspen's pristine powder. And there's been even more hostility in Jackson Hole. When Joe Cascia of New Jersey visited recently, he encountered a local who griped about Ikon passholders not spending enough at local restaurants, for being cheap. JOE CASCIA: I'm not too sure why he would have saw that as a negative because I think everybody should be trying to save money. CASCIA: I even told her, as a guy, you might want to put that in your pocket here because it just didn't feel 100 percent welcome. BERGMAN: Resorts, on the other hand, are embracing the passes. Taylor Middleton, the head of Big Sky Resort in Montana, penned an open editorial to local residents ordering them to be nicer. TAYLOR MIDDLETON: There's a little heat in the community. BERGMAN: In fact, Ikon passholders only account for a small increase in the number of visitors. The biggest reason for the crowds - well, according to Middleton, it's this year's great snow. MIDDLETON: I think the Ikon Pass is somewhat unfairly blamed by some. BERGMAN: Like it or not, the pass is here to stay says its chief marketer, Erik Forsell of Alterra. ERIK FORSELL: We definitely launched with the idea of disrupting in a positive way the ski industry. And we did. BERGMAN: Forsell says resorts like locking in guaranteed revenue in case of a bad snow year. Next season's pass just went on sale, and one skier from Salt Lake City commented on the Facebook announcement you have ruined skiing. Please stop. 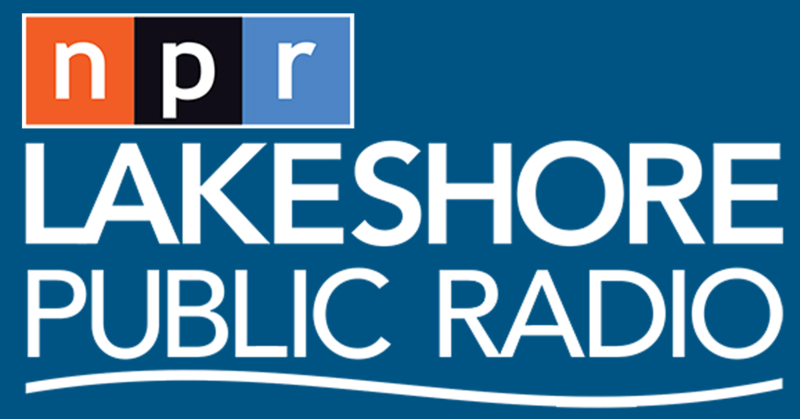 For NPR News, I'm Ben Bergman. (SOUNDBITE OF MEDESKI MARTIN AND WOOD'S "SUGAR CRAFT") Transcript provided by NPR, Copyright NPR.